Basel, 29 October 2018. The Baloise Park high-rise has now reached its full height of 89 metres. This is a key milestone in this impressive project for the client Baloise Group and the total (design-and-build) contractor Steiner AG. 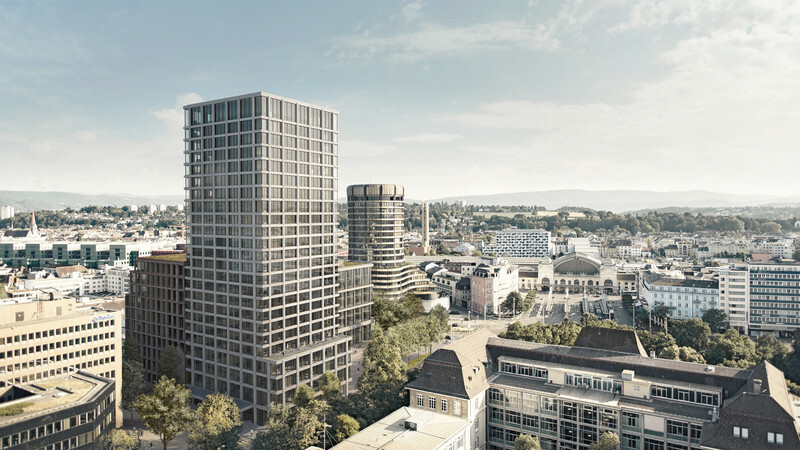 Once complete, the elegant high-rise with a hotel and attractive office space will shape the Basel cityscape in future. With Baloise Park, Baloise is creating its new head office, a modern 5-star city hotel, its own training centre, office space for third-party tenants, and a public plaza. Of the approx. 1,300 office workspaces in total, Baloise will use around 700 itself. The other 600 spaces will be rented out. The high-rise will accommodate the Mövenpick Hotel Basel with 264 rooms, a restaurant and a fitness and wellness centre. The top seven of a total of 24 floors of the tower will be leased as office space. The high-rise is being built to a design by Miller & Maranta, the firm of architects that also devised the development plan for Baloise Park. Steiner AG was appointed as total (design & build) contractor to implement the approx. 90-metre building. The substructure of the plaza with a ballroom for 650 guests and underground car park was completed in shell-and-core condition in spring 2017. In July 2017, 2,400 m3 of concrete was used for the foundations of the high-rise. The building shell reached ground level in autumn 2017. A few days ago, the high-rise reached its full height. Baloise Park is located outside of the old town and the site of the former city walls, in the immediate vicinity of the SBB railway station. There are important pedestrian routes from the station to the old town via Elisabethenstrasse and Aeschengraben. Baloise Park incorporates the existing green space into the cityscape and enhances the area despite the increase in density. Baloise sees the plaza as a new open space for the city.